Classic trek is also called the "Baby Trek", easy and mild hiking conditions. This classic is also called the Baby Trek because of the easy and mild hiking conditions. 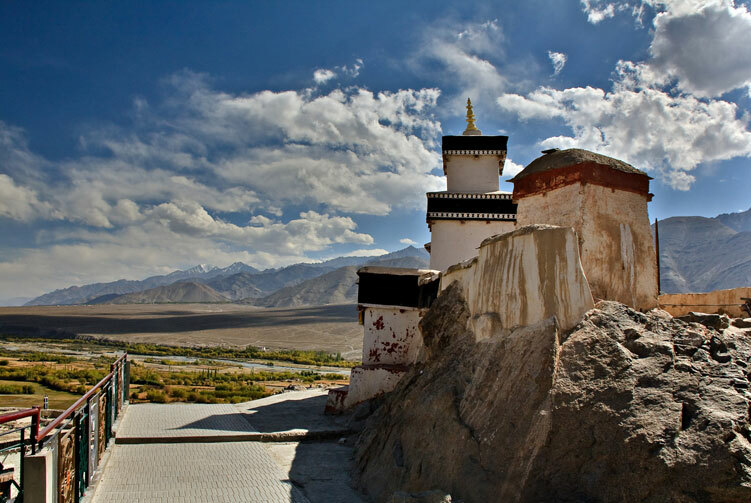 Starting from Likir, one passes through several villages among the richest in Ladakh tour and its worth visiting the monasteries of Likir, Ridzong and Tingmosgam on the way. This is the trek that can be done throughout the year, as the passes are not very high and don't get snow-blocked during the winter. This is one of the easy Trekking in Ladakhwhere one does not need a tent. It leads through historical villages with stupas, mani walls, chortens and small gompas. In July the noon temperature crosses 30 degree Celsius. Trekking in Ladakh is said to be trouble-free from Likir to Temisgam. One can look forward to a very enjoyable trek; easy to start for those who are short on time. It starts a little to the west of Leh in the rich village of Likir, and cross several low passes with pretty villages in between. One gets to see the ancient spiritual monasteries. 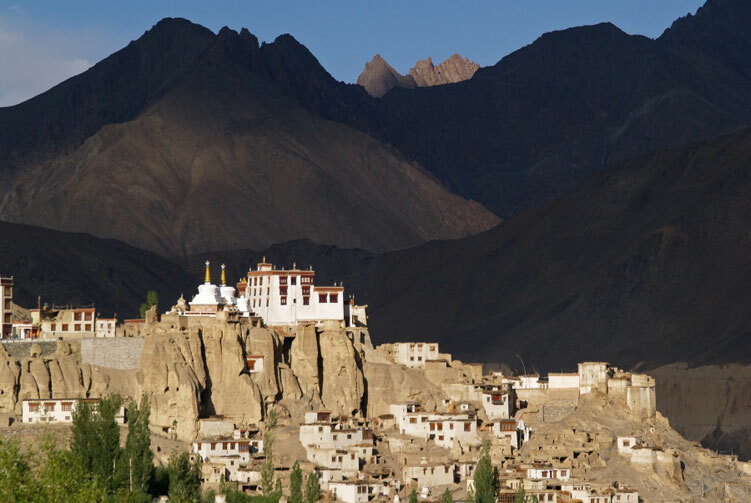 In fact Ladakh travel itself has a very pleasant landscape and life-style. Start walking early in the morning, take a break at noon and continue again around 3 pm. One will meet people working in their fields; enjoy beautiful landscapes with villages like oasis in the desert. Day 01: Arrival at Delhi International airport and day sighseeing. Day 02: Fly Delhi to Leh. Kushok Bakula Airport. Day 03: Full day Jeep tour Sightseeing to biggest and famous monasteries of Ladakh at Indus valley. Day 04: Half day acclimatization hiking to adjacent villages of Leh City including sightseeing to Shanti Stupa, Samkar Gompa and 17th century Leh palace. Day 06: Trek from Yangthang to Hemis-Shukpachan. 4-5 hrs trek. Day 07: Trek from Hemis Shukpachan to Tingmosgang. 4-5 hrs trek. Day 08: Drive to Leh, enroute visit Lamayuru Monastery and 11th century Alchi Choskor Temple "The living heritage of Ladakh reaching Leh evening check into Hotel. Day 09: Free day at Leh for exploring Leh market and shopping. Day 10: Fly Leh to Delhi and to your home country. We offer you the best price guaranteed for Likir to Tingmosgang Trek. Likir is a small town located in Ladakh, which is part of the state of Jammu and Kashmir in India. 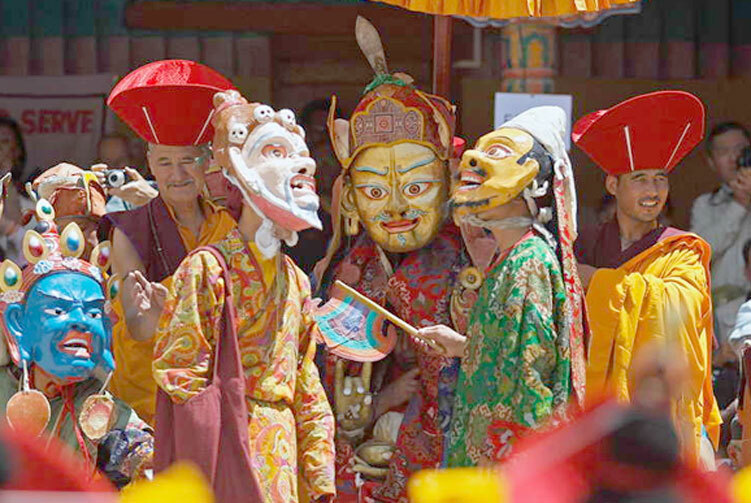 It is perhaps most famous for the nearby Klu-kkhyil (meaning "water spirits") Gompa. The Likir Monastery was first built in the 11th century and was rebuilt in the 18th century, and currently has a 25-foot-tall (7.6 m) gold-covered Buddha statue. It is occupied by monks of the Gelukpa order. It is located 52 km from Leh. Likir Monastery or Likir Gompa (Klud-kyil) is a Buddhist monastery in Ladakh, northern India, located approximately 52 kilometres (32 mi) west of Leh. It is picturesquely situated on a little hill in the valley near the Indus River and the village of Saspol about 9.5 kilometres (5.9 mi) north of the Srinigar to Leh highway. It belongs to the Gelugpa sect of Tibetan Buddhism and was established in 1065 by Lama Duwang Chosje, under the command of the fifth king of Ladakh, Lhachen Gyalpo (Lha-chen-rgyal-po). Tingmosgang is a town on the bank of Indus River in Ladakh, in northwestern India. It is 92 km west of Leh, near Khalatse, and north of the present main road. The town has a palace and the monastery over a hillock. Tingmosgang was built by King Drag-pa-Bum as his capital in the 15th century. 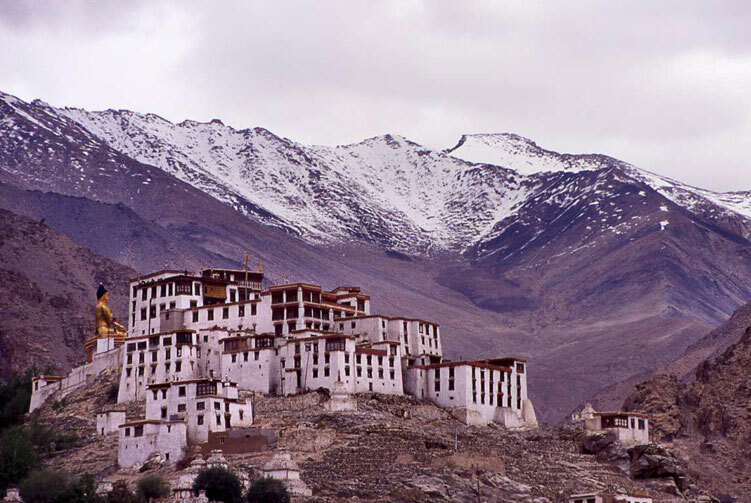 It is through his grandson Bhagan that Ladakh's second dynasty originated - Namgyals ( Victorious) which politically endured until the Dogra annexation in 1841 and whose lineage still lives on in the Stok Palace. Tingmosgang is also important from an historical point of view. After the death of the Fifth Dalai Lama, the Regent ruling Tibet sent the head of the Drukpa order here as an emissary and in 1684 the "Treaty of Tingmosgang" was signed between Ladakh and Tibet wherein the boundary between the two countries was demarcated as we find it today, besides other religious and trade agreements. Geographically, the Indus Valley is the back-bone of Ladakh, historically from Upshi down to Khaltse, it is Ladakh's heartland. All the main places associated with Ladakh's dynastic history- Shey, Leh, Basgo and Tingmosgang- together with all the important gompas, outside Zanskar, are situated along this stretch of Indus.